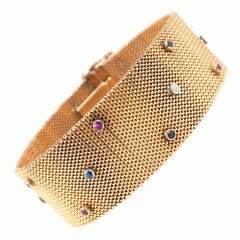 S.Georgios designer bracelet handmade from solid 18 Karat Yellow Gold. This One of a Kind piece is microscopically decorated all the way around with gold wires and beads. Granulated details contrast with Byzantine velvet background. The Bracelet features A Unique Cut Trillion Emerald Center Solitaire 5.35 Carat, and Emerald Cut Rubies and Sapphires total weight of 21.30 Carat and Diamonds total weight of 1.50 Carat. It can also be ordered in White or Rose Gold, please contact us. This Gorgeous Bracelet is all custom made in our workshop in Athens Greece and is of outstanding workmanship and quality. Width: 40,00 mm Weight: 135.30 grams Please contact us for size details, as it can be sized to any size. For a full selection of S.Georgios jewelry please visit our storefront here on 1stdibs – Georgios Collections Inc. For regular update click FOLLOW, not to miss any new releases. More beautiful jewels are coming every week!